I recently made some herbal recipes that celebrate summer, in spite of the 100+ degree temps. Inspired by the herbs that are thriving in my garden right now, I went online and researched recipes. 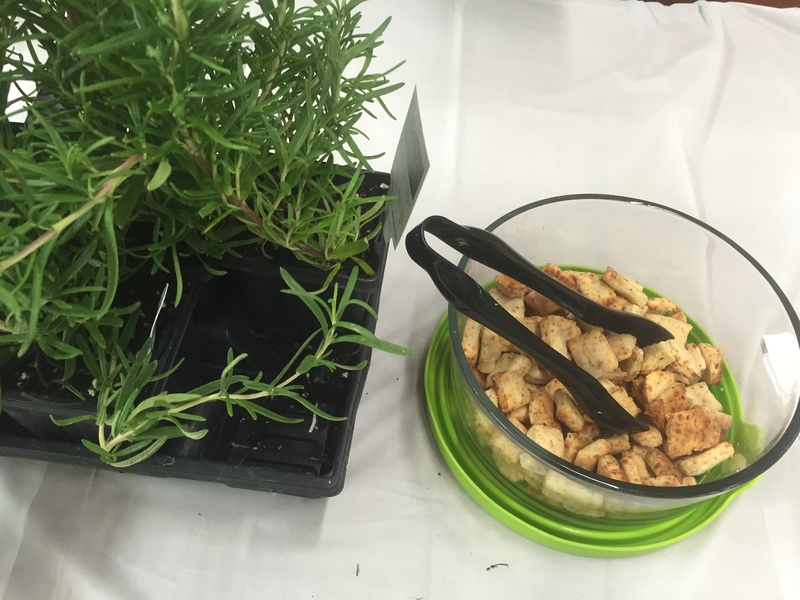 I found these awesome recipes and tweaked a couple to enhance the flavors with my herbs. 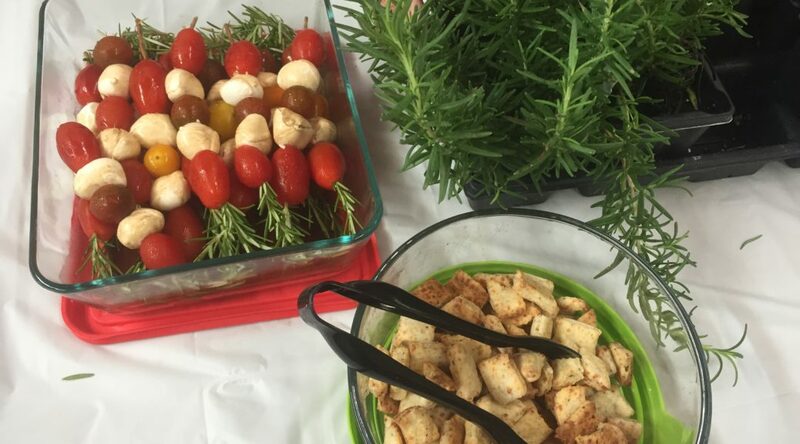 Consider these easy recipes for your summer celebrations. 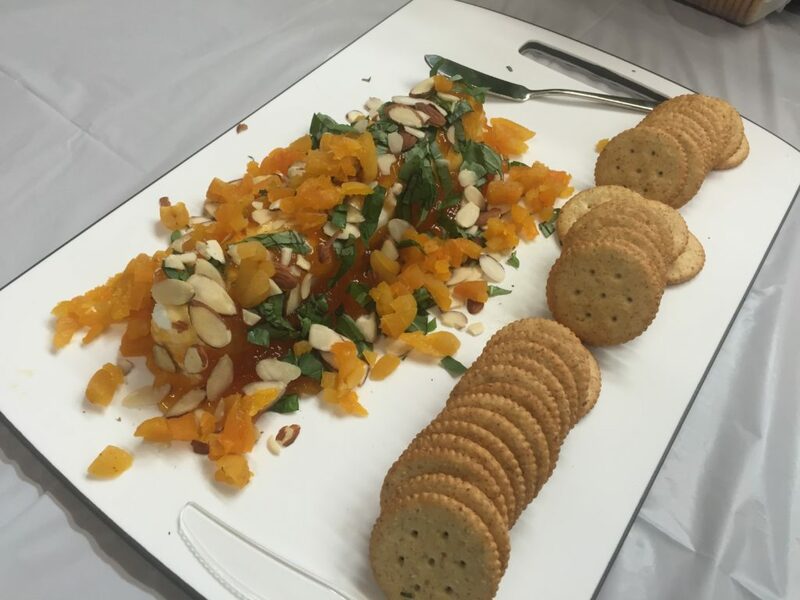 I recently attended a wine tasting at my friend Jennifer’s house, and she served up this delicious fruity cheese spread with crackers. And oh my, though I typically am not a fan of goat cheese, this fruity treatment made this appetizer so YUMMY. Top goat cheese with dried apricots, apricot preserves, and almonds to taste. Sprinkle with basil. Serve with butter crackers. In the summertime, it can be refreshing to drink a tall glass of sweet lemonade. Or, add mint to ice water or tea for a nice cool drink. But here’s a different twist on lemonade. 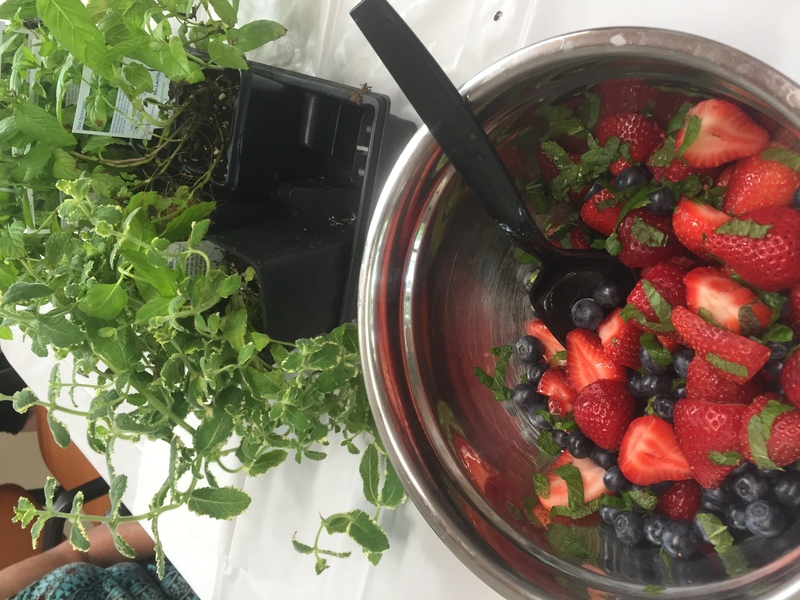 You might be thinking – basil in lemonade? Though the flavors may not seem to complement each other, this recipe has a subtle undertone of basil with the strawberries and lemon juice balancing out the flavors. Quite yummy. Make a simple syrup on the stovetop. (Note: when making the simple syrup, I cut the two cups down to 1.5 cups and thought it tasted just lovely.) 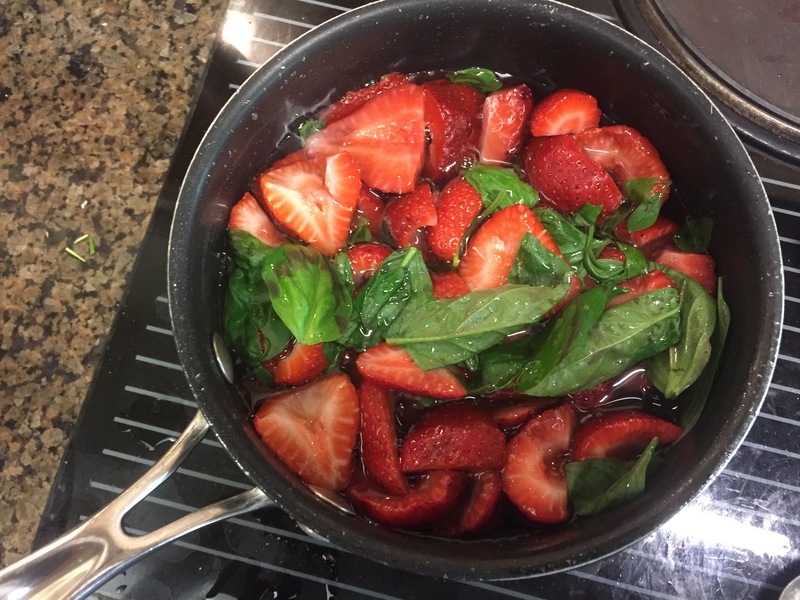 Then steep the strawberries and basil leaves in the warm simple syrup for about 30 minutes or until cooled. 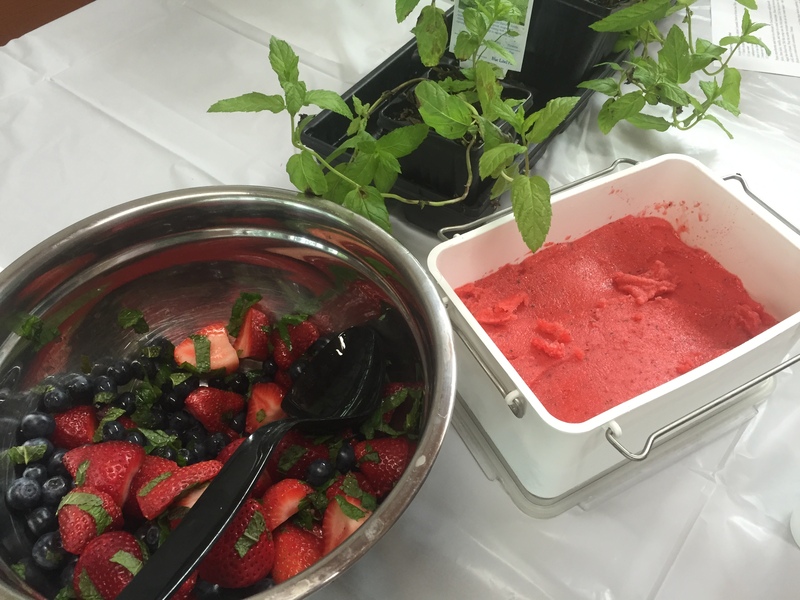 Strain out the strawberry and basil pulp. Add lemon juice, cold water, and ice. Serve chilled with lemon slices. Check out the complete strawberry basil lemonade recipe from Paula Deen at FoodNetwork.com. Any form of ice cream, popsicle, or sorbet makes for a cool summer treat. I love this sorbet recipe that features mint and strawberries, with a twist of lime. Puree strawberries and a handful of mint leaves in a blender or food processor. Make a simple syrup of lemon juice, juice of one lime, sugar, vanilla, and water on the stovetop. Combine the puree and simple syrup together and chill in the fridge for several hours. Then add the mixture to your favorite ice cream machine and stir until it is a frozen or semi-solid consistency. (I used my electric ice cream machine according to manufacturer instructions.) Transfer to a separate container and put in the freezer. Serve frozen. Enjoy! Recipe adapted from the strawberry sorbet recipe at Eating Well. 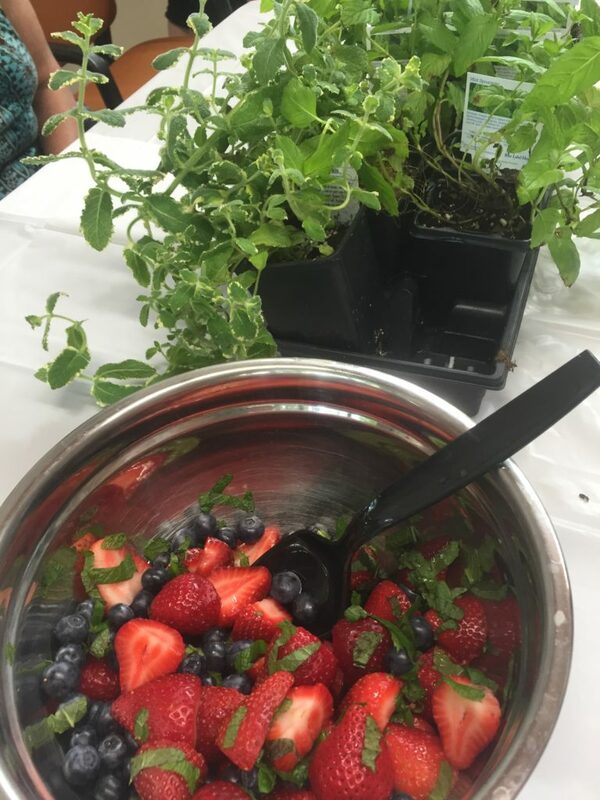 Prepare your favorite berries – strawberries, blueberries, raspberries, etc – in a bowl. Add chopped mint leaves and the juice of one lime. Stir together and serve. When using rosemary in any recipe, a little goes a looooonnnnngggg way. And this cheesy crispy cracker recipe incorporates rosemary just right. Ingredients include parmesan cheese, flour, butter, cream (I subbed milk), pepper, cayenne, salt blended together in a food processor. Roll out the dough and cut crackers to size. Bake them on a cookie sheet and eat them hot right out of the oven. Easy peasy! Check out this rosemary and pepper crackers recipe by Valerie Bertinelli at FoodNetwork.com. Cut rosemary stems six- to eight-inches long off the plant. Strip the the leaves off most of the stem, leaving one end with one- to two-inches of leaves intact. 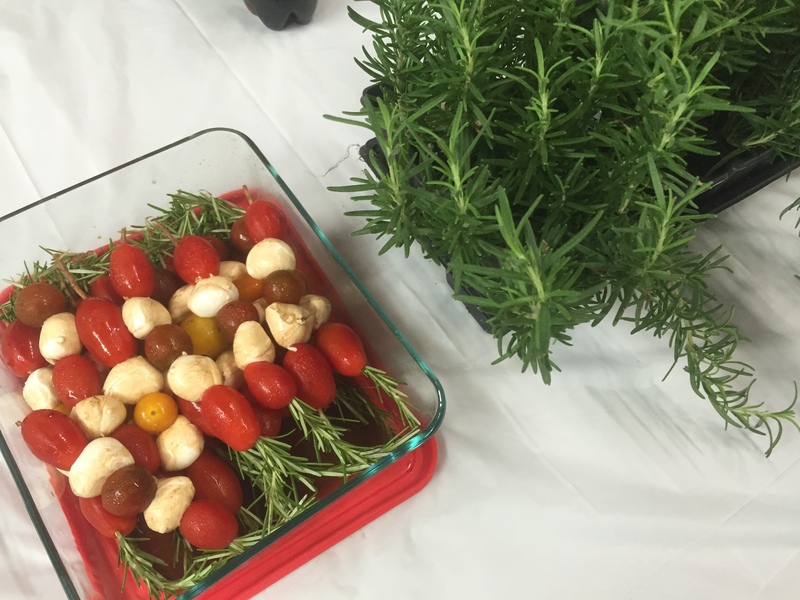 Skewer tomatoes and fresh mozzarella bites (I like the mozzarella pearls for ease of use) onto the rosemary stems. Then top tomatoes and mozzarella with balsamic vinegar and serve. Easy way to add pizzazz to your serving table. My favorite little reliable herb, lemon thyme is planted along the edge of retaining wall and has slowly filled in the crevices of the wall over time. The little leaves are fun to use in adding a zest to this vinaigrette recipe. Shake together lemon thyme leaves, honey, lemon juice, garlic, salt, and pepper in a mason jar, and then add olive oil and shake well. Serve on your favorite greens. 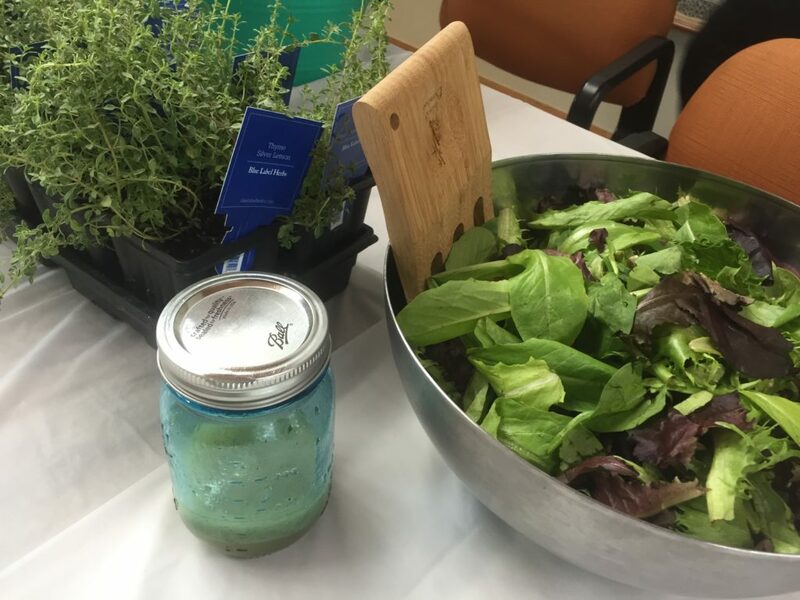 Check out this lemon thyme vinaigrette recipe at Little B Cooks.